Martin Luther King was a great leader of the Civil Rights Movement in America. On the 3rd Monday in January we celebrate his birthday and honor his life and work for peace, justice and equality. Below are some great resources for celebrating Martin Luther King Day. If you are looking for the best books for Read Alouds for Grades 1-4 just click on the picture above for 10 wonderful books to share with your students. At Kids' Turn Central you will find many great websites with information and activities to help celebrate MLK Day. Just click on the picture above. You will find free ideas for crafts and free activities as well. You can find Free Lesson Plans, a Play, Games and more by clicking on the picture above. I would also like to share a free activity from my Martin Luther King Unit that I just uploaded. I also wrote a Shared Reading Book and Guided Reading books about the life and work of Martin Luther King in my unit. One of the activities from my packet is a Compare and Contrast Venn Diagram and Writing Activity. Students will compare and contrast their childhood to Martin Luther King's childhood. Then they will use their Venn Diagram to help them write a paragraph. Just click on the image below to download the Preview File and get your free activity and also see all the other materials in the unit. 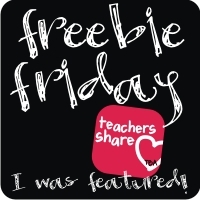 Hope you found some great free resources to use with your students. Don't forget to visit Show and Tell Tuesday over at Sunny Days in Second to see all the other great blog posts about MLK. Just click on the picture below. For those of you headed back to your classrooms tomorrow after Christmas Break, have a great new year with your students! What activities do you do in your classroom for Martin Luther King Day? Cute ideas! I am a new K teacher blogger! I am a Kindergarten teacher right outside of Nashville (Franklin). I am trying to get my name out there and for people to check out my blog. I am having a hard time tapping in to the teaching blogging world. Any advice/shout-outs would be greatly appreciated! Hi Elizabeth. The best advice I can give you is to check out lots of other blogs, comment on them, use pinterest and pin your blog posts. You may want to sign up for TBTS which you can check out by clicking on my TBTS bus at the top right of my page. Good luck.